So it seems we have been given a reprieve from all the rain. With that said, join Velo Urbano for one of our group rides. We will be departing from our shop and heading out at 8am and head out into the surrounding area. We operate a no drop group ride so no one has to worry about being left behind. The ride will depart promptly. Join Velo Urbano for one of our group rides. We will be departing from our shop and heading out to Sharon Center and back. The ride is about 16miles (26km). We operate a no drop group ride so no one has to worry about being left behind. The ride will depart promptly. Ok folks, it has been raining on our parade, but the weather for this Sunday is looking good. Join Velo Urbano for one of our group rides. We will be departing from our shop and heading out for a loop into D.W. Field Park and back. The ride is about 15miles (24km). We operate a no drop group ride so no one has to worry about being left behind. The ride will depart promptly. Join Velo Urbano for one of our group rides. We will be departing from our shop and heading out for a loop into D.W. Field Park and back. The ride is about 15miles (24km). We operate a no drop group ride so no one has to worry about being left behind. The ride will depart promptly. Join Velo Urbano for another of our group rides, this time a loop through the back roads Easton, Mansfield, and Sharon. We will depart from Oliver Ames High School and make our way through lite trafficked tree line roads of Easton and Mansfield on our way to Sharon. Once in Sharon we will stop off at Angels Cafe for coffee and recovery before making our way back to the high school. We will be meeting up in front of the high school football stadium like last time. If you plan to attend please let us know so we can be on the look out for you. Like always we will wait up to five minutes past the hour for late arrivals. If you think you might be late please give us a call so that we can wait for you. We look forward to riding with you. Join us for a group ride, this time through the back roads of Easton, Stoughton and the quiet city streets of Brockton. On the return leg of the ride we will stop off at Whites Bakery for some coffee and recovery. The ride will be departing from Oliver Ames High School where we will be meeting up in front of the football field. Like always, please give us a heads up if you plan to attend the ride. Parking is available at the high school and there is a lot in front of the football field. We will wait up to five minutes past the hour for late arrivals. If you think you might be running late give us a ring so that we can wait for you. Join Velo Urbano for another group ride, this time to Bridgewater and back. The ride will start off at Oliver Ames High School in Easton, then head into the City of Brockton, where we will make south into the Town of Bridgewater. Once we arrive in Bridgwater Central Square, we will begin our ride back to Easton via West Bridgewater. We will be stopping off at White's Bakery on the last leg of the ride where will will rest and chat one another up. If you plan on attending please email us so that we know you will be coming. Parking is available at the high school. We will gather in front of the football field. We will wait up to five minutes past the hour for those who might be arriving late. If you think you might be late please give us a call and we will wait for you. Join Velo Urbano for another cafe ride to Angel's Cafe in Sharon MA. The ride will depart from the new Shovel Town Brewery and them make its way up back roads to Sharon Center. Once we reach the cafe, will recovery and have some coffee before making our way back to the brewery. Parking around this location is tight, so please be advised. There is parking in the neighborhood streets just north of the brewery and around the Rockery in the center of town. We ask those choosing to ride to not park in brewery parking since park there is limited. Please be aware of no parking signs. Additional parking can also be found at Oak Ames High School which is only a short pedal south of the brewery. If you plan to attend the rides please give us a heads up. If you plan to park at the high school and want some one from the crew to ride up to the brewery with you, shoot us an email or Facebook notices and someone will meet you at the high school. We look forward to riding with you. Join Velo Urbano for a group ride back to Ride Headquarters, a premier bicycle shop in Sherborn MA. This will be our ride making up for last Sunday's canceled group ride. We will begin the ride starting off at Sharon High School and make our way through the towns of Walpole and Medfield before reaching our destination. Once at our destination we will have some coffee and recover before the ride back. Parking is available at both the school and at the Walter Griffin Playground. Like alway give us a heads up so that we know you will be joining the ride. We will wait up to five minutes past the hour for those that end up running late. If you think you might be late please give us a call and we will wait for you. We look forward to riding with you. Join Velo Urbano for a group ride back to Ride Headquarters, a premier bicycle shop in Sherborn MA. We will begin the ride starting off at Sharon High School and make our way through the towns of Walpole and Medfield before reaching our destination. Once at our destination we will have some coffee and recover before the ride back. Join us for another cafe ride, this time to Nine Bar Espresso in Davis Square Somerville. We will depart Forest Hills Station and travel down the South West Corridor and then swing through the North End before jumping the river and head onto the cafe. Like always we ask that you please give us a heads up if you plan to attend via phone or by email. Our contact info can be found on this website. Please be mindful that the weather will be on the cold side and please dress accordingly. We will wait up to five minute past the departure time for late arrivals, so if you think you might be late please give us a call. We look forward to riding with you. Got nothing going on this Sunday? Now you do! Join us for one of our group rides this Sunday in Boston. The meet up location is the MBTA Orange Line Forest Hills metro station main parking lot. We will ride the S.W. Corridor, then make our way through Back Bay and Cambridge to the Minuteman bike path, and travel the Minuteman to Lexington where we will stop off at Ride Studio Cafe for some coffee and socializing. Please give us a heads up via phone or email if you plan on coming so that we will be on the look out for you. If you think you might be late, please give us a call. Our phone number is listed on the contact us section of the site. For those that don't give us a heads up that they will be arriving late or coming at all, we will wait up to five minutes past the start time for late arrivals. Parking is available at the metro station for a fee of $7. We encourage those arriving by car to park at the paid lot rather than trying to find street parking due to parking restrictions - We would hate for you to get a ticket or be towed because we were out on the ride longer than the parking restriction gave you to park. We look forward to seeing you on the ride. Join Velo Urbano for another one of its cafe rides, this time to Seven Star Bakery's East Providence location. We will be meeting up at the beginning of the Black Stone River Bikeway in Woonsocket RI, then make our way through the City of Pawtucket and then arrive at the bakery location at the Rumford Center. Once we arrive at the bakery, we will take coffee and some pastries before heading back to our origin. Like always, please give us a heads up if you plan to attend so that we know you are coming. There is plenty of free parking at the bikeway entrance. Of course we will be waiting up to five minute past the hour for those who might arrive late. If you think you might be late to the ride please give us a heads up so that we can wait for you. If there is foul weather the ride will be canceled and rescheduled. We look forward to riding with you. Join Velo Urbano for another of our cafe rides, this time to Bridgewater. 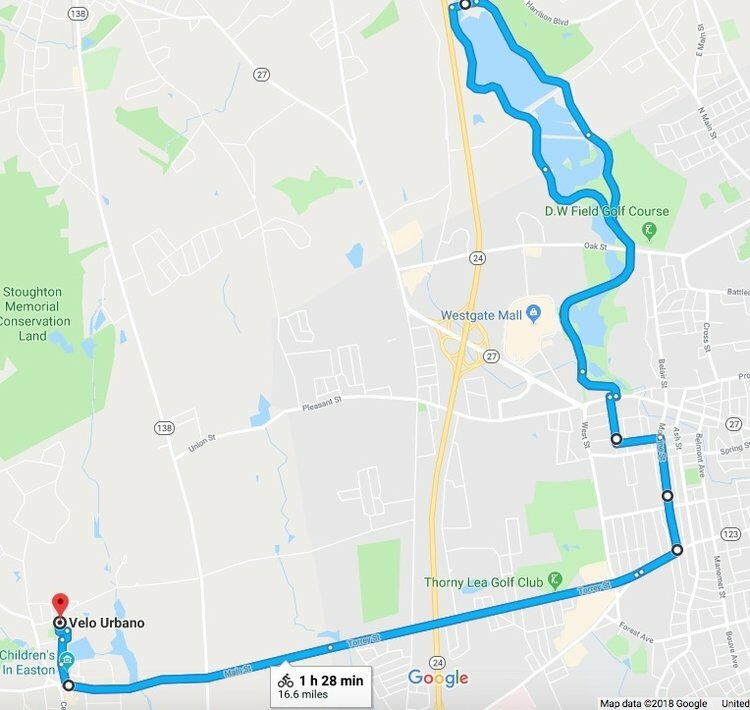 We will be meeting up at West Jr High School in Brockton and then make our way to Bridgewater via Copland and South St. Once we reach Bridgewater Center, we'll make our way back with a stop off at Whites Bakery before the conclusion of the ride. Like always please give us a heads up if you plan to attend. As always we will wait up to five minutes past the hour for late arrivals. If you think you will be late please give us a call so that we can wait for you. We look forward to riding with you. Its been a while since we last held a ride, but we all know how weather and the holidays can through a monkey wrench into game plans. With that said, join us for another cafe ride, this time to Nine Bar Espresso in Davis Square Somerville. We will depart Forest Hills Station and travel down the South West Corridor and then swing through the North End before jumping the river and head onto the cafe. Ok folks, we're going to try to do the snowed out ride this coming Sunday. Join Velo Urbano for a cafe ride to Sharon MA. This ride will start at Oliver Ames High School in Easton, then proceed to Sharon and with a stop off at Angels Cafe for a morning cup, socialization, and then the ride back. We will wait up to 5 min past the hour for late arrivals. If you plan on arriving by car, parking is available at the temple's parking lot and on street parking. If you plan on attending, please give us a heads up via phone or email so that we can be on the look out for you. Join us for another cafe ride to Cilla's Cafe in Norfolk. The ride will depart from Oliver Ames High School in Easton, traveling numerous low traffic roads through the towns of Easton and Mansfield before arriving at the cafe. Once we reach our destination, will stop off to recover and socialize over coffee and pastries before we head back. Parking is available at the high school, but it is a park at your own risk situation since we do not have a parking agreement with Easton schools. There is plenty of free legal street parking on neighboring community streets if that suits you better. Like always, please give us a heads up if you plan to attend so that we can be on the lookout for you. We look forward to seeing you on the ride. Join Velo Urbano for another group ride to Ride HQ. Ride HQ is basically a second location of Ride Studio Cafe in Lexington MA. We will depart from Oliver Ames High School and head through the towns of Sharon, Walpole, Medfield and then arrive in Sherborn where HQ is located. Once at Ride HQ, we will have some coffee and recover before heading back. We will meet up at the parking lot in front of the track & field/football field. Parking is available at the school as a park at your own risk situation since we do not have a parking agreement with Easton schools. We have never had a problem with parking at the school. Please give us a heads up if you plan to attend via email or by phone so that we know to be on the look out for you. We will wait up to five minutes past the hour for late arrivals. If you think you might be late please contact us so that we can wait for you. We look forward to riding with you. Join Velo Urbano for a group ride to Franklin and back this Sunday. We will be leaving from Easton's Oliver Ames High School and make our way through Easton, Mansfield, Foxborough, and Norfolk before arriving at our destination. Once in Franklin we will stop off at The Cake Bar, a specialty bakery specializing in cakes, for coffee and pastries before we head back. We will be departing from Oliver Ames High School in Easton. Like always if you plan to attend please give us a heads up so that we know you are coming. For those that decided to drive there is plenty of parking at the school and have had no issue with parking. We will wait up to five minutes past the hour for late arrivals, but please give us a call if you are running late so that we don't leave without you. We look forward to having you on our cafe ride. Join us for cafe ride to Cilla's Cafe in Norfolk. The ride will depart from Oliver Ames High School in Easton, traveling numerous low traffic roads through the towns of Easton and Mansfield before arriving at the cafe. Once we reach our destination, will stop off to recover and socialize over coffee and pastries before we head back. Join us for a group ride, this time to Briggs Garden and Home. Briggs Garden and Home is as it sounds, a home garden and decor retailer. Now I know you are wondering why would we be riding there, well they are a unique home and garden retailer that has a cafe on site serving up New Harvest Coffee; the same coffee we roast at our farmers market pop up bicycle cafe. We will depart from Oliver Ames High School in Easton and head through the Town of Mansfield before arriving at our destination in North Attleboro. Once we arrive at Briggs, will order up come coffee and recover for the return leg of the ride. We will be returning along the route in which we came. Like always please give us a heads up if you plan on attending the ride so that we can be on the lookout for you. Parking is a park at your own risk situation since we do not have a parking agreement with Easton school, but parking at the high school has never been an issue. There is also plenty of on street unrestricted parking in high school adjacent neighborhoods near by. If you know you might arrive late to the meet up location, please give us a call or shoot us a text so that we can wait for you. We will wait five minutes past the departure time just to make sure we don't miss anyone that has not reach out. We look forward to see you on the ride. Join us for another cafe ride to Unlikely Story in Plainville. Unlikely Story is a independent bookstore/cafe owned by the author of a series of kids books called Diaries of a Wimpy Kid. The ride will depart from Oliver Ames High School in Easton, traveling numerous low traffic roads through the towns of Easton and Mansfield before arriving at the bookstore/cafe. Once we reach our destination, will stop off to recover and socialize over coffee and pastries before we head back. Join Velo Urbano for a ride to Bridgewater. We will be departing from West Jr High School in Brockton. We will meet at the front steps of the Jr HS. Once we arrive in Bridgewater we will head on back and stop off at the Brockton Starbucks to take coffee and recover. Once we have rested we will head back to the Jr High School. If you plan on attending the ride please give us a heads up via email or by phone so we can be expecting you. We will wait up to five minutes past the hour for late arrivals. Please give us a call if you end up being late so that we can wait for you. Parking is available at the Jr high school as a park at your own risk situation since we do not have a parking agreement with Brockton public schools. There is also unrestricted street parking located east of the school in adjacent neighborhoods were you can park. We look forward to see you on the ride. Join Velo Urbano for a ride to Medfield. We will be departing from Oliver Ames High School and pedal are way through Easton, Sharon, and Walpole before arriving in Medfield. We will meet at the front steps of the HS. Once we arrive in Medfield we will take coffee and recover at Stabucks. Once we have rested we will head back via the route in which we arrived. If you plan on attending the ride please give us a heads up via email or by phone so we can be expecting you. We will wait up to five minutes past the hour for late arrivals. Please give us a call if you end up being late so that we can wait for you. Parking is available at the high school as a park at your own risk situation since we do not have a parking agreement with Easton public schools. There is also unrestricted street parking located east of the school in adjacent neighborhoods were you can park. We look forward to see you on the ride. Join Velo Urbano for another group ride, this time to Ride HQ. Ride HQ is basically a second location of Ride Studio Cafe in Lexington MA. We will depart from Oliver Ames High School and head through the towns of Sharon, Walpole, Medfield and then arrive in Sherborn where HQ is located. Once at Ride HQ, we will have some coffee, food, and check out the new shop. Once we have finished up, we will head back the way in which we came. Join Velo Urbano for another of our group rides, this time to Milton. We will be leaving early Sunday morning from West Jr High School in Brockton. Once we depart we will be traveling through D.W. Field Park and then Oak Street to Route 37 until we reach Quincy. In Quincy we will travel Hancock and then connect to Adams Street and head into Milton stoping off at Starbucks for recovery. After we are rested we will head back the way in which we came. If you plan on attending please give us a heads up so that we know you will be coming. If you will be arriving late please give us a call so that we will wait for you. Like always we will wait up to five minutes past the hour for late arrivals. Parking is available at the school as a park at your own risk situation since we do not have a parking agreement with Brockton Schools. There is plenty of on street free unrestricted parking for those that rather utilizes that option. We look forward to seeing you on the ride. Join Velo Urbano for a ride to Medfield. We will be departing from Oliver Ames High School and then pedal are way through Easton, Sharon, and Walpole before arriving in Medfield. We will meet at the front steps of the HS. Once we arrive in Medfield we will take coffee and recover at Stabucks. Once we have rest we will head back via the route in which we arrived in Medfield.